Saleh Hassan al-Faqeh holds the hand of his four-month-old daughter, Hajar, who died of malnutrition at the al-Sabeen hospital in Sanaa, Yemen, Nov. 15, 2018. "She was like skin on bones, her body was emaciated," he said. 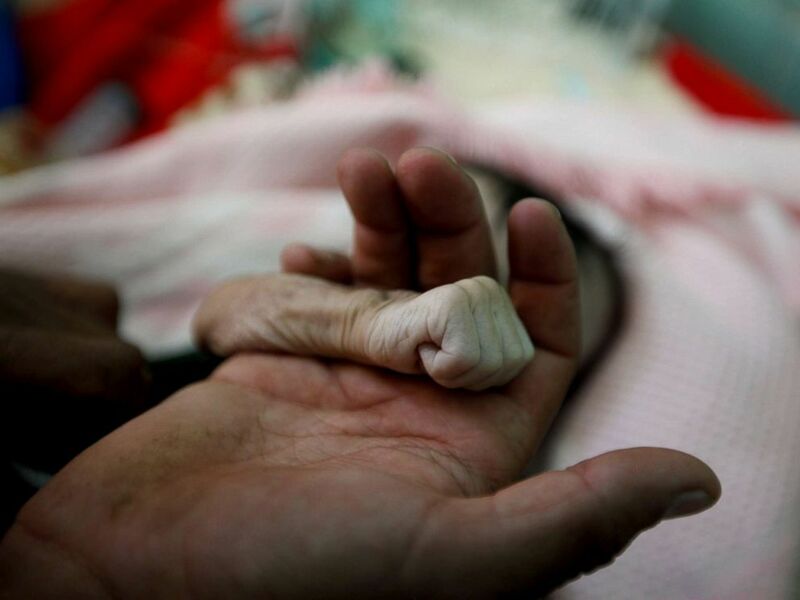 Saleh al-Faqeh held the wasted arm of his baby girl as she took her last breath on Thursday at the malnutrition ward of the main hospital in Yemen's capital, Sanaa. Four-month-old Hajar al-Faqeh reached the al-Sabeen hospital last week from Saada province, one of thousands of Yemeni children suffering from malnutrition in a country that has been pushed to the brink of famine by more than three years of war. 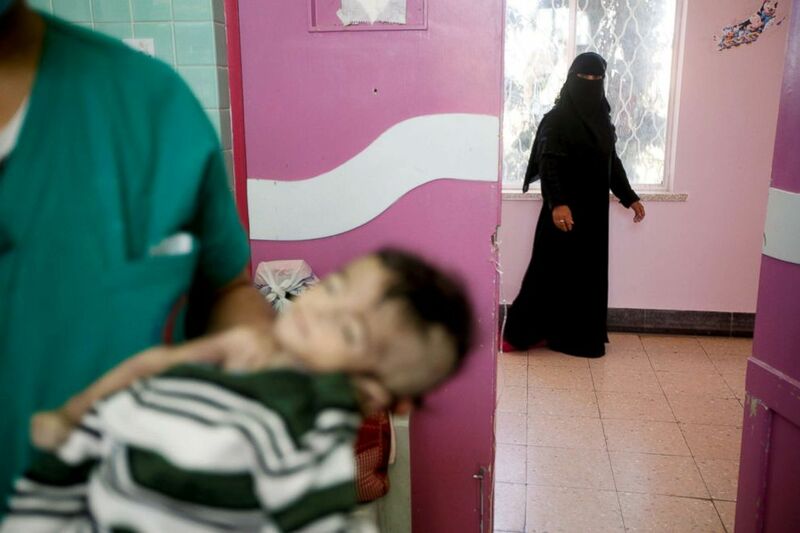 Her body lies in the same ward where another baby boy, Mohammed Hashem, died from severe hunger on the same day. His passing was witnessed by a Reuters photographer. Doctors confirmed they had died of malnutrition. Saleh Hassan al-Faqeh covers the body of his four-month-old daughter, Hajar, who died at the malnutrition ward of al-Sabeen hospital in Sanaa, Yemen, Nov. 15, 2018. 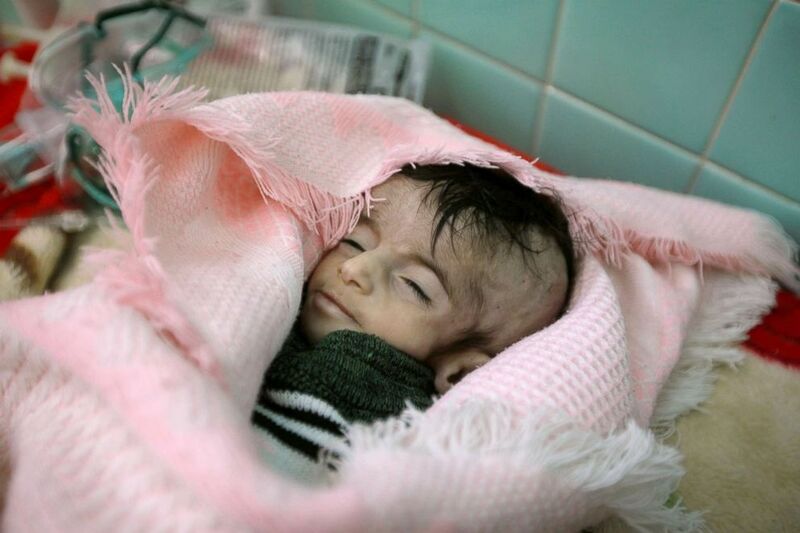 "She has spent two months in a hospital in Saada, but we had to bring her to Sanaa," her father said. Saada province is a stronghold of Iran-aligned Houthi rebels, who have been fighting a Saudi-backed government for nearly four years in a war that has killed 10,000. Four-month-old Hajar Saleh al-Faqeh, who died at the malnutrition ward of al-Sabeen hospital, is seen at the hospital in Sanaa, Yemen, Nov. 15, 2018. Meritxell Relano, the UNICEF representative in Yemen, said in September that more than 11 million children, or about 80 percent of the country's population under the age of 18, were facing the threat of food shortages, disease, displacement and acute lack of access to basic social services. The Faqeh family braved a dangerous journey along mountain roads where air strikes from the Saudi-led coalition are frequent. "I worked in construction and I am also a driver. I do whatever I can but I am unemployed now," her father said. The mother of four-month-old Hajar Saleh Hassan al-Faqeh, who died at the malnutrition ward of al-Sabeen hospital, walks by as a nurse holds her daughter's body in Sanaa, Yemen, Nov. 15, 2018. The United Nations says 22 million Yemenis, out of a population of 29 million, rely on humanitarian aid. Almost 18 million are considered hungry and 8.4 million severely hungry. Fouad al-Reme, a nurse in al-Sabeen hospital, said Hajar was conscious when she came to the hospital but she suffered low oxygen levels. "She was like skin on bones, her body was emaciated," he said. Writing by Aziz el Yaakoubi for Reuters.